“Since being named head coach of our football program, I have been obsessive in my belief that our program should model behavior that is consistent with excellence, good character and high morals. This past Friday, some of my actions weren’t consistent with this. 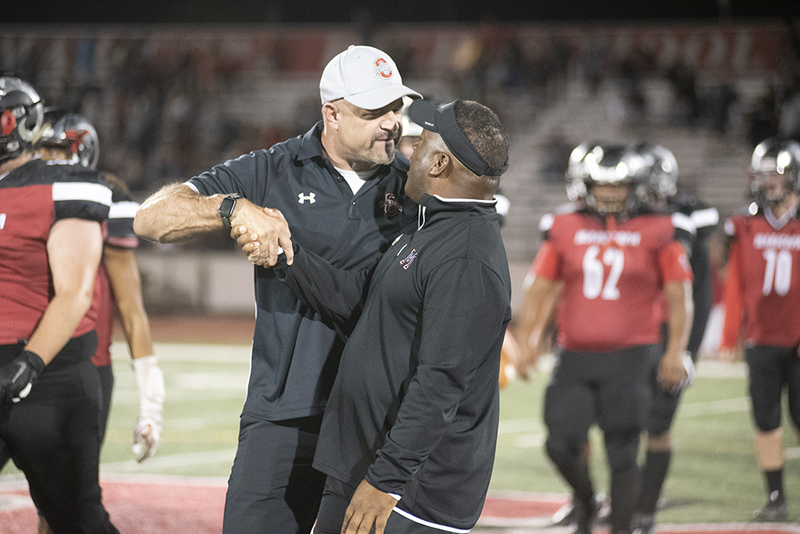 My direct supervisor (AD Jake Neill) instructed me to do certain things at the end of the altercation with Central’s coach, and I did not comply. “After reflection, I realize that my actions are not consistent with what I have modeled for our coaches and players up to this point. I can’t in good conscience accept that this should be overlooked. I have suspended players this season and sat players – even just last week for conduct I felt was unbecoming. I am just a man, I am fallible, and I make mistakes. I made one last Friday. “To not hold myself to the same standards I talk about wouldn’t be the right thing to do. I’m as competitive as they come, and I live for matchups like this Friday, because if you are a competitor you want to coach in big games against the best competition possible. So, this is as painful as it can be for me, but as much as it pains me, and the obvious jeopardy it will put our team in, some things are more important than wins and losses – I want to be remembered for how I lived my life. I hope all learn 2 valuable lessons from this whole thing. There are times we should just not speak. Most of these times is when our negative emotions are running high. Doesn’t matter the reason. Then being human enough to realize we all make mistakes and acknowledge them and then make it right by an apology. Just saying you’re sorry is not enough. You must acknowledge what you did and say why it’s wrong of you to have done so. This coach deserves our praise and admiration for the way he handled his mistake. Just as we all want forgiveness we should be gracious enough to say thank you for that and forgive. Just remember coach, please do not make a habit of it.